Steve started flying in 1997, and it became a great passion, he eventually purchased a flight school. He lived as Marc Anthony wrote; If you do what you love, you'll never work a day in your life. 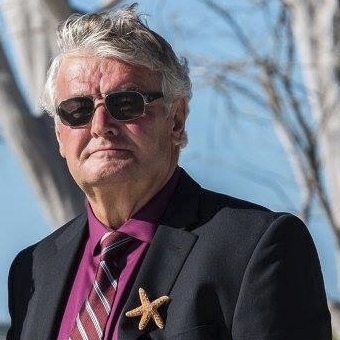 It is with great sadness that the family of Stephen George Fox Steve of Indian Rocks Beach, FL announces his passing on September 27, 2018 at the age of 66. Steve was born April 27,1952 in Toronto, Ontario. He was preceded in death by his father, Herbert Fox and is survived by his mother, Joan Fox; and brothers Micheal (Karen), and David (Ruth Anne). Steve was a true Patriarch of his family and was larger than life, he loved being on the water and boating. Steve started flying in 1997, and it became a great passion, he eventually purchased a flight school. He lived as Marc Anthony wrote; If you do what you love, youll never work a day in your life. He was protective over his loved ones. He was a good friend to many. And if there was something he could do for you, he would. Memorial Service details to be determined in the near future. 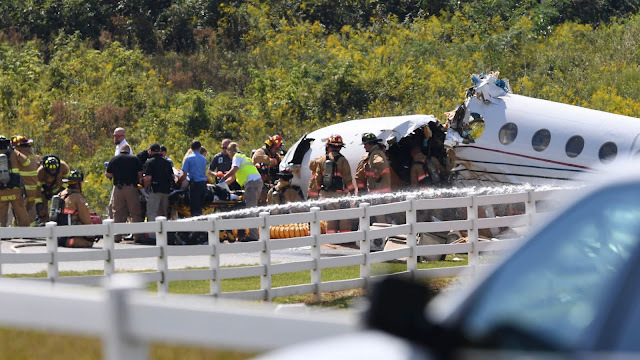 A Tampa health care executive and her husband were the two passengers who survived a jet crash in Greenville, S.C. that killed the pilot and co-pilot last week. 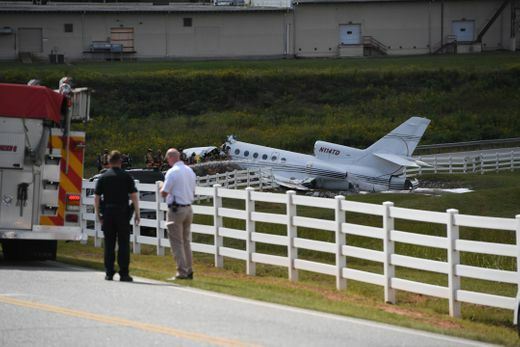 Marci Wilhelm and husband Steve Rose were on board the Dassault Falcon 50 that rolled off the runway and crashed after landing at the Greenville Downtown Airport on Sept. 27, according to Susan Salka, president and CEO of AMN Healthcare. AMN purchased MedPartners, the Tampa-based health care staffing firm Wilhelm founded, for $195 million earlier this year, according to a news release at the time. Wilhelm stayed on as CEO. "We are more than co-workers at AMN — we are family," Salka said in the statement. "Our thoughts go out to the family and friends of the pilots who lost their lives in the accident, and right now everyone at MedPartners and AMN Healthcare is focused on doing all we can — both personally and at work — to help Marci and Steve as they heal. It will take patience and hard work, but fortunately both are expected to make a strong recovery." 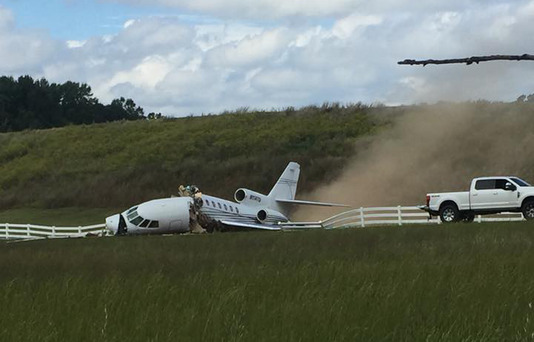 After rolling off the runway, the jet plunged down a grassy embankment and came to rest on a road. The fuselage split into two pieces behind the cockpit. Rose posted a public update on his Facebook page Wednesday saying he and Wilhelm were involved in "a chartered plane crash" and have "significant injuries that will take long recoveries" but doctors are optimistic both will make a full recovery. "It’s nothing short of a miracle!!!!!" the post said. "We are overwhelmed by the thoughts, prayers, and offers of assistance from all over the country and beyond. You are all truly amazing. THANK YOU!!! In the post, Rose and Wilhelm offered sympathies to the families of the two men killed in the crash, pilot John Christian Caswell of Port St. Lucie and co-pilot Stephen George Fox of Indian Rocks Beach. Fox, 66, owned two flight services companies, Clearwater Aviation and Air America Flight Services, that provide charters and pilot training. Clearwater Aviation is a sub-tenant at St. Pete-Clearwater International Airport. 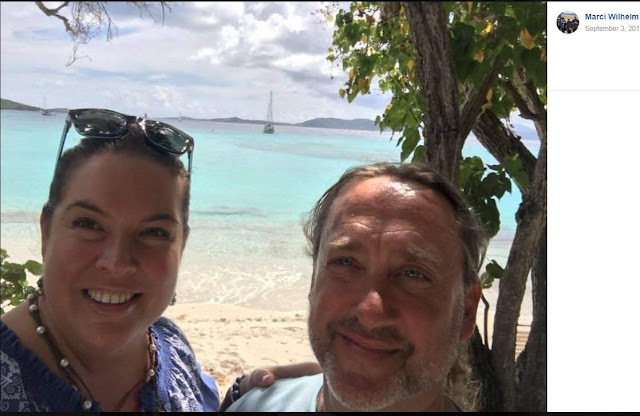 The couple’s Facebook post thanked friends and family who helped protect the couple’s identity in the days after the crash. Federal and local authorities had refused to name the couple. "We have actually had a few smiles over being referred to as ‘Unnamed married couple’ for the last five days," the post says. "There may be a tattoo in that somewhere down the road." "We are in a marathon not a sprint," the post concludes. "Our goal is to get healthy enough to travel and then make our way back to Tampa to finish recovery. We look forward to seeing you all then." Federal authorities have said the flight originated from St. Petersburg. 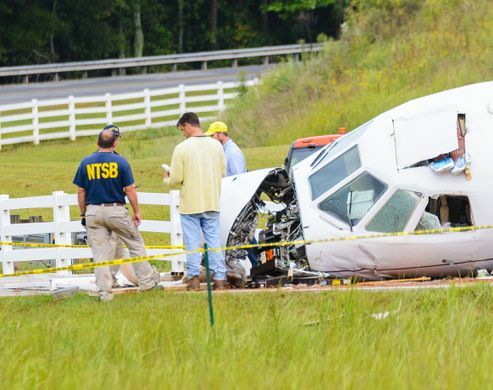 The National Transportation Safety Board and the FAA are investigating the crash. A preliminary report is expected later this month. The Times reported this week that federal records show neither pilot was qualified to fly the Falcon 50. Caswell had "second-in-command privileges only" for a Falcon 50 jet, meaning he could only fly that type of jet as a co-pilot with someone who has a pilot-in-command rating, according to the Federal Aviation Administration’s Airmen Registry. No Stephen Fox or Stephen George Fox in the registry has a pilot-in-command or second-in-command rating for the Falcon 50, FAA records show. The records also indicate Fox was certified only as a private pilot, which means he wouldn’t be legally permitted to pilot or co-pilot a chartered flight. And the records show Fox was certified only for visual flight and didn’t have the rating required to fly an aircraft like the Falcon 50 under instrument flight rules. Steve Fox wanted his family business to live on after him. Passionate about flying and about his air charter company, Fox once asked buddy Jim Collier to make clear to Fox’s sons how much he wanted them to carry on with Air America Flight Services after he was gone. "He said, ‘If anything happens to me, tell those boys to keep that place going," Collier recalled. On Thursday, tragedy did befall the family. Fox, 66, of Indian Rocks Beach was killed when a jet in his company’s fleet crashed shortly after landing in South Carolina, authorities said. 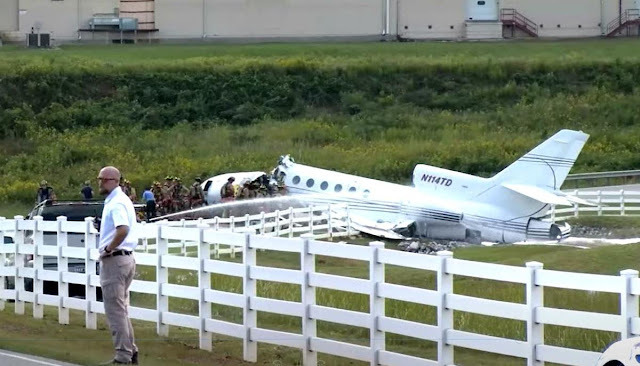 Fox was co-pilot aboard a Dassault Falcon 50 when the triple-engine plane ran off the runway at Greenville Downtown Airport and fell 40 to 50 feet before the fuselage split behind the cockpit, airport officials said. Fox was pronounced dead at a local hospital. The other pilot, 49-year-old John Christian Caswell of Port St. Lucie, was pronounced dead at the scene of the crash, according to the Greenville County Coroner’s Office. Two passengers, a husband and wife, survived but are in serious condition, officials said. 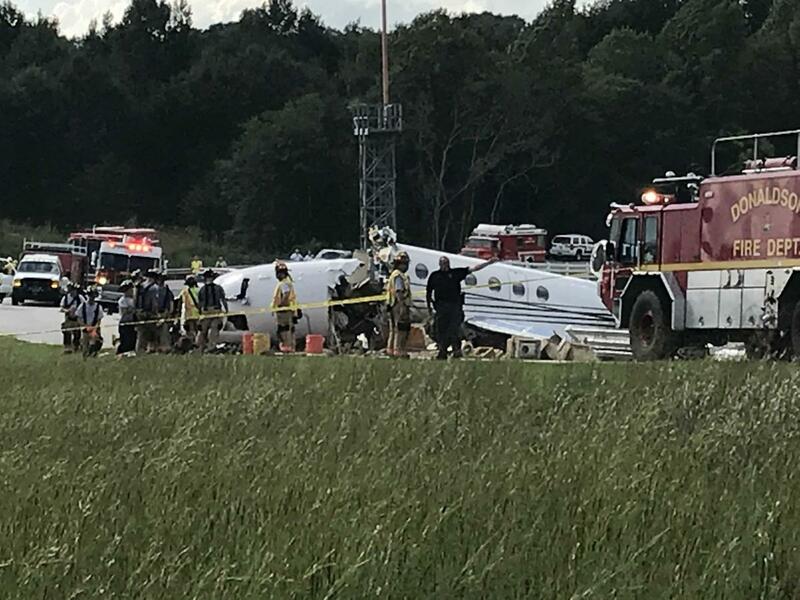 Authorities said the reason for the crash was not immediately clear but the Federal Aviation Administration and National Transportation Safety Board are investigating. Voice recordings, air traffic control recordings from minutes before the crash and surveillance video from nearby businesses will help provide answers to what happened as the plane arrived at the airport, Dan Boggs, air safety investigator with NTSB, told reporters at a news conference Friday, according to the Greenville News. Boggs said a crane was brought in to help remove a voice recorder from the belly of the plane, the News reported. Investigators weren’t sure whether the plane, a 1982 model, had a flight data recorder due to its age. Boggs said the plane was flying from Tampa and Greenville was it’s final destination. The report did not specify which airport in Tampa. Boggs said both Caswell and Fox had significant experience flying, logging 11,600 hours and 5,500 hours, respectively. A preliminary crash report is expected in two to three weeks and a full report will take 12 to 18 months. 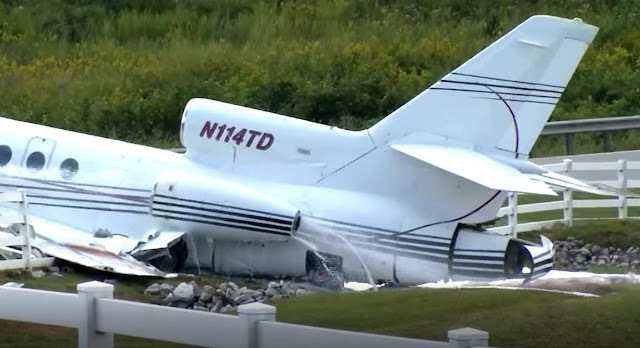 The plane appeared to land successfully before it ran off the runway, Joe Frasher, the airport’s director, said at a news conference Thursday. "We all saw it land and for some reason it did not stop," he said. 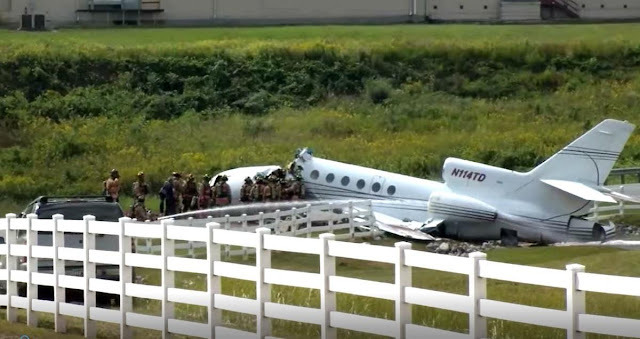 After leaving the runway, the plane plunged down a grassy embankment, crashed through a fence and came to rest on Airport Road. Crews cleaned up fuel that spilled from the plane. Frasher said Thursday evening that one of the injured passengers was able to speak and the other was in surgery. Their names have not been released. 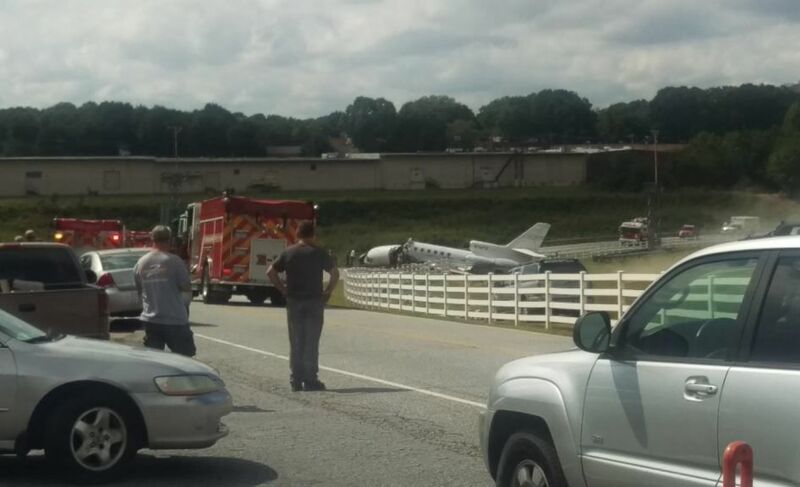 Frasher called it the worst crash the Greenville airport has seen in 20 years. "We have aircraft this large and larger routinely land at this ramp," he said. "It’s very rare that this has happened." FAA records show that the plane is owned by Global Aircraft Acquisitions LLC of Delaware. Its two previous owners were companies in Pinellas County. Clearwater Aviation is a tenant at the St. Petersburg-Clearwater Airport, said airport spokeswoman Michelle Routh. A man who answered a phone number listed for the businesses declined to comment Friday. A page on Air America’s site features photos of a Falcon 50, a sleek aircraft that seats nine in a plush leather-appointed cabin. The jet has a range of 3,400 miles and top speed of 400 knots, the website says. Fox ran the company with his sons Travis and Tim, according to Collier, a Hudson accountant who knew Steve Fox for about 13 years and used to do his books. Fox lived in Indian Rocks Beach with his wife Valerie, Collier said. Steve Fox was not rated to captain a jet like the Dassault, so for flights like the one on Thursday, he served as co-pilot and got someone else to captain the aircraft, according to Collier. Collier is not a pilot but said he has fond memories of flying with Fox over the men’s 13-year friendship. "When the Lord says you’re going, you’re going," Collier said. "I’m going to miss him. He was just one hell of a guy." Collier picked up the phone Friday morning and called Travis Fox, who was waiting for more details on the crash, and delivered his message as requested: Remember your father wanted you to keep the business going. "He’s so distraught," Collier said, "but he’s in there at work." 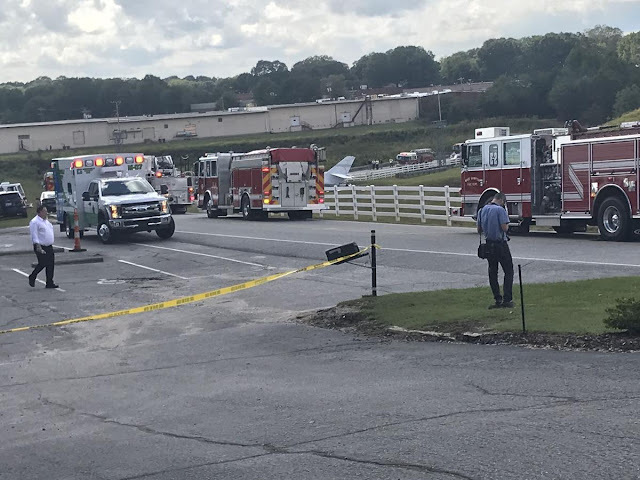 (WSPA) - Two people died and two people were critically injured after a jet crashed at the Greenville Downtown Airport Thursday afternoon. According to Greenville Police Department spokesperson Donnie Porter, the call about the crash came in around 1:40 p.m. Porter said the plane ran off the runway and crashed. 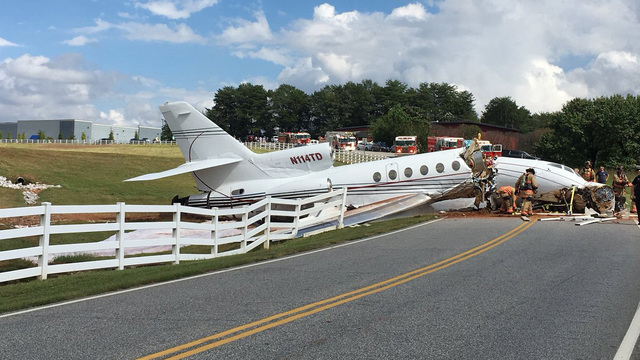 Greenville County Coroner Jeff Fowler confirmed that two people died following the crash. Greenville City Fire spokesperson Tristan Johnson confirmed that the two people who died were the pilot and the co-pilot of the plane. Johnson said that the two people injured in the crash are married and are currently in critical condition. Greenville Memorial Hospital officials told us that three people were taken to the hospital following the crash. 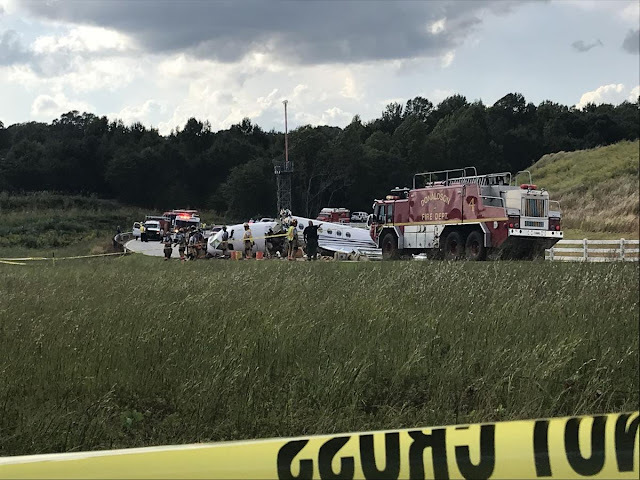 During a second news conference Thursday, City of Greenville Fire Chief Steve Kovalcik said that one of the three people that were taken to the hospital died at the hospital, and said the other deceased person was still in the crashed jet. According to Kovalcik, after the plane ran off the runway, there was a small fire. The fire has since been put out. Kovalcik said the two deceased people -- the pilot and the co-pilot -- are both men. He said the two men appeared to have died from injuries related from the crash, but said an autopsy will be performed to confirm their cause of death. 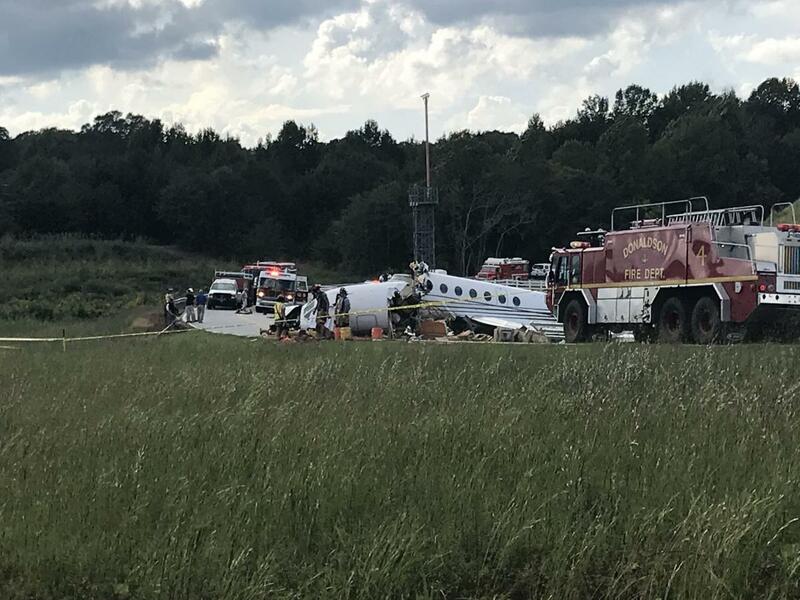 Federal Aviation Administration and National Transportation Safety Board officials are currently en route to the scene to investigate the crash. South Carolina Department of Health and Environmental Control officials have also responded to the scene because of fuel that leaked from the plane. 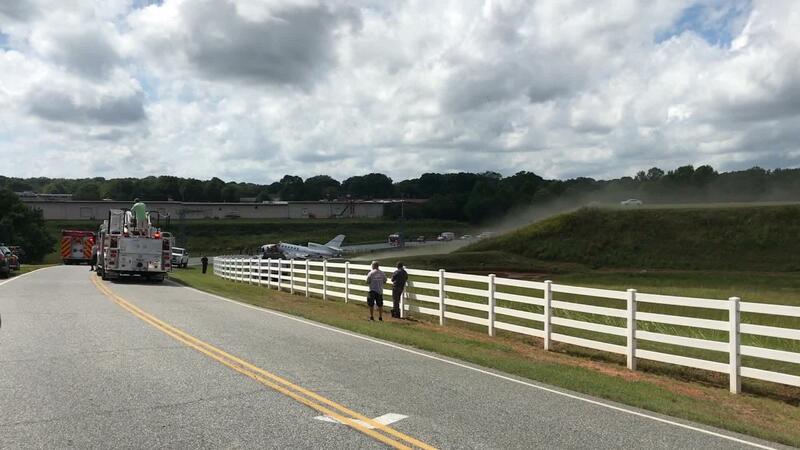 Officials said the fuel leaked off of airport property, but said it has since been contained at Haywood Road. They said some of the fuel was reportedly being absorbed into nearby river banks. 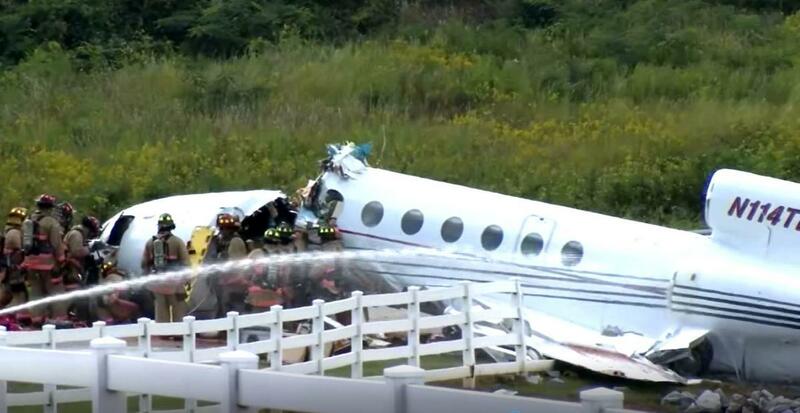 According to the Federal Aviation Administration's website, the plane is registered to Global Aircraft Acquisitions LLC of Lewes Delaware. The plane is a Dassault Falcon 50. Airport Director Joe Frasher said the plane landed on the runway and then, for unknown reasons, could not stop. The plane continued off the runway, across a grassy area, down an embankment, and crashed at the edge of the road. Four people, two pilots and two passengers, were on board the plane at the time of the crash, Frasher said. Deputy Coroner Jeff Fowler confirmed just after 3 p.m. that two people had died. 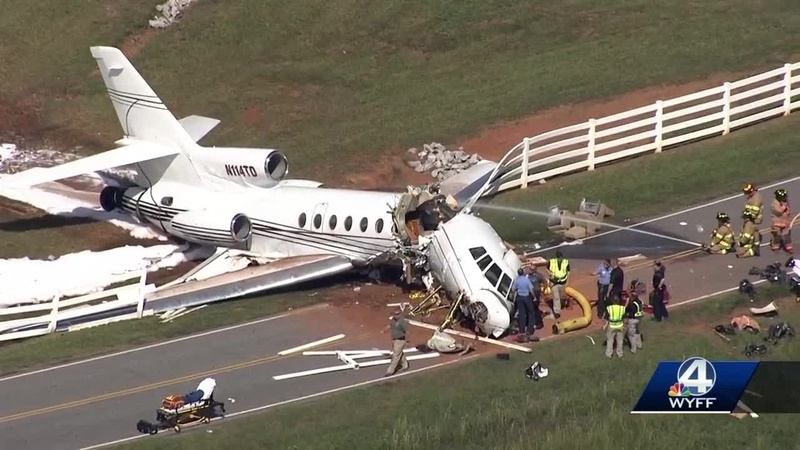 Three people were transported from the scene to the Greenville Health System but a fourth was trapped in the jet, officials said. 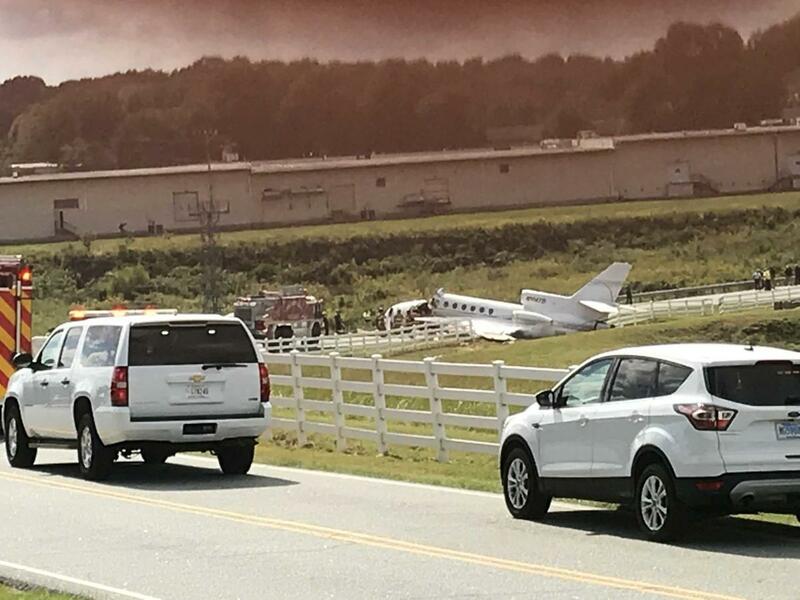 A spokesman for the Greenville Fire Department said the pilot and co-pilot died. The survivors were passengers, a married couple, and are in critical condition. One pilot was pronounced dead at the scene. The other died at the hospital, Coroner Parks Evans said. All of the victims had to be extricated from the plane. 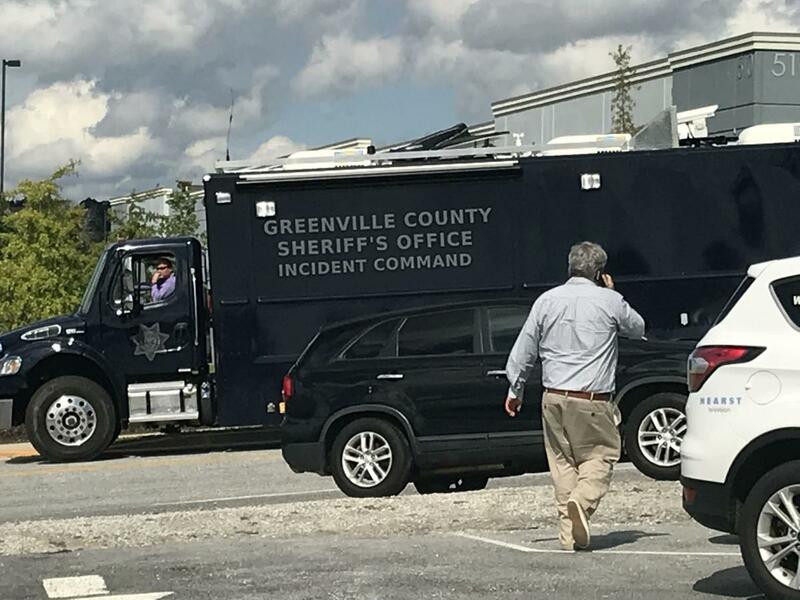 Greenville police Chief Ken Miller asked people to avoid Airport Road because the jet leaked fuel, leading to a Hazmat situation. 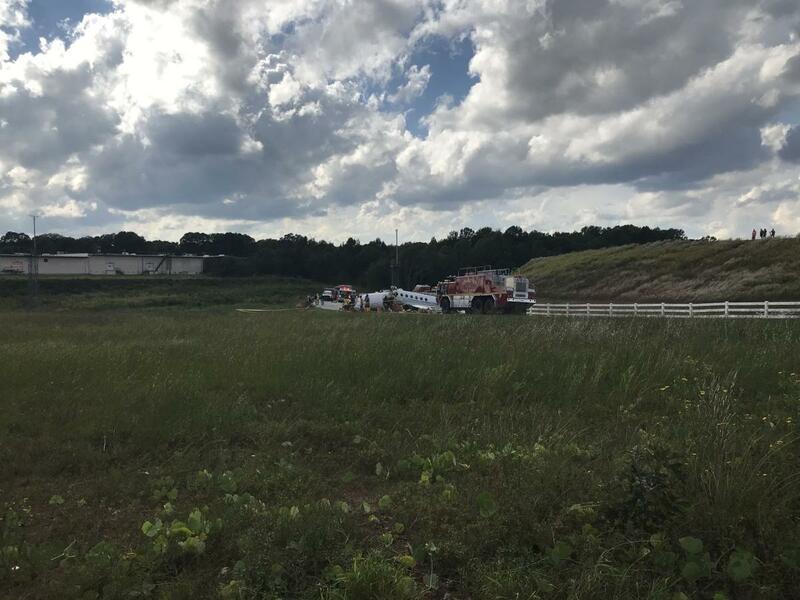 Hazmat crews were working to contain and absorb the fuel, which was flowing downstream toward Haywood Road, Miller said. Miller said Airport Road would be closed for some time as the FAA and NTSB investigates the crash. The Dassault Falcon 50, was registered out of Delaware to Global Aircraft Acquisitions. There is no word yet on where the flight originated. It looks like the plane went off the departure end of runway 19. The runway is 5393 ft long x 100 ft wide, plenty of length for a Falcon 50. It's sad and a bit ironic that runway 1, the opposite direction of 19, has an EMAS system to stop a plane from overrunning the end, but its dropoff is nowhere near as steep as that which N114TD went over! I hope the business is able to survive the tragedy, my condolences to the family and friends of those affected. Another aviation website has a posting that mentions the PIC was type rated only for SIC in the airplane. 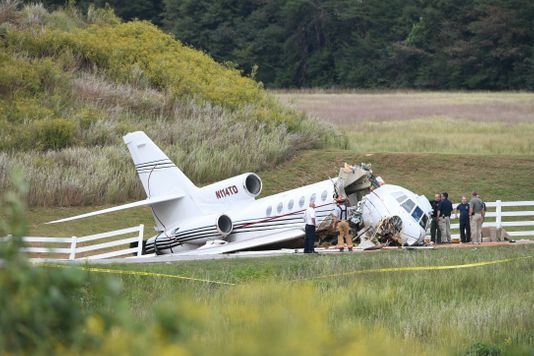 The owner in the right seat did not appear to have an instrument rating. I don't know if he would be legal in that seat under Part 91 and/or Part 135. I hope the PIC did not misrepresent his quals to the owner. Wow! Just checked the FAA data base and you are right .... SIC only. Neither pilot was rated in the airplane and the airplane itself was not qualified to be doing part 135 charters. To fly an aircraft above fl180 you must be instrument rated. Does the FAA do random general aviation ramp checks or do they wait for somebody to "drop a dime" and depend on that or the "darwin principle?" "To fly an aircraft above fl180 you must be instrument rated." They were qualified in that respect ... Both ATP ... Specific aircraft qualification not so much. 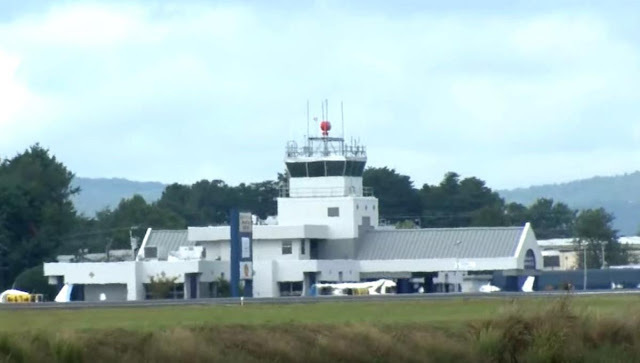 While the FAA database does not show that they had the correct ratings, A local Greenville online news article was updated today to eliminate any reference to the pilots being not qualified. Yesterday that article had that reference. So maybe both pilots got the correct quals in the last month and that paperwork has not made it into the FAA database. 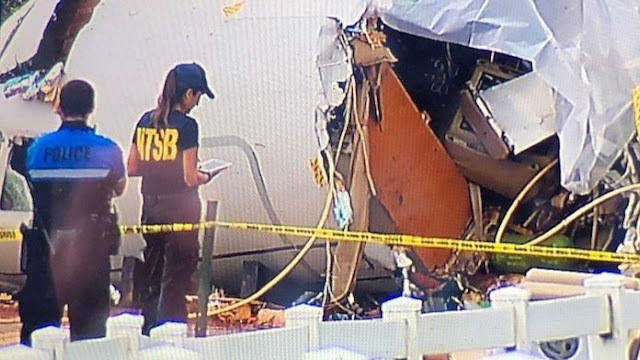 NTSB report will clear any doubt up. Yep ... Sure looks like another typical South Florida 134 and 1/2 charter operation. Article with video of jet nearing end of runway and crash. There is a flash from the plane shortly before it reaches end of runway. Possible blew tire. If they had been landing in the opposite direction the plane would most likely have been stopped by the runway overrun protection system installed at that end of the runway. To the IDIOT that posted "Yep ... Sure looks like another typical South Florida 134 and 1/2 charter operation. ", stop slamming South Florida. If you cannot say something positive; then just SHUT THE HELL UP..MORON. Not a moron ... While there are legit operators in South Florida the area is over run by marginal/illegal operations. I stand by my statement. My apologies if my comment struck a nerve ... Maybe a little too close to home? Not much positive in your angry post. I hope your day improves. This was a case of an aircraft that already had mechanical issues before it departed coupled with an inexperienced, unqualified aircrew on an illegal 135 charter. This operator was known for this. No surprise. The FSDO and NTSB need to do an immediate revocation of the 135 air carrier certificate. The Tampa FSDO should be investigated!!!! They allowed this company to do this for years....Steve would regularly have payments waiting for them in mailbox for FSDO to look other way!! True that ... If you look at the wreckage you would think it was survivable. However, if you look at the plunge in the video, all it would take for a fatality would be lack of shoulder harness use. We will see what NTSB comes up with. Anonymous states "The Tampa FSDO should be investigated.." Then goes on to proffer charges of bribery. I'm quite sure the NTSB will look into that possibility, but they'll not make such statements until they're certain of these claims. People must be careful about what they say, particularly when they start leveling criminal charges against others. Hopefully, if some form of coercion or other influences are discovered, we'll be reading about them in official reports, instead of speculating. The "plunge" as you described it would have subjected the occupants to zero Gs, then a force of at least five Gs positive along with deceleration and transverse loads as the fuselage split would have been a hell of a ride. It looked survivable, and two passengers did survive. The pilot was 66 years old. That may have been the reason why he did not. ... And the passengers didn't have an instrument panel for their heads to impact ... Age probably less of an issue than you think. 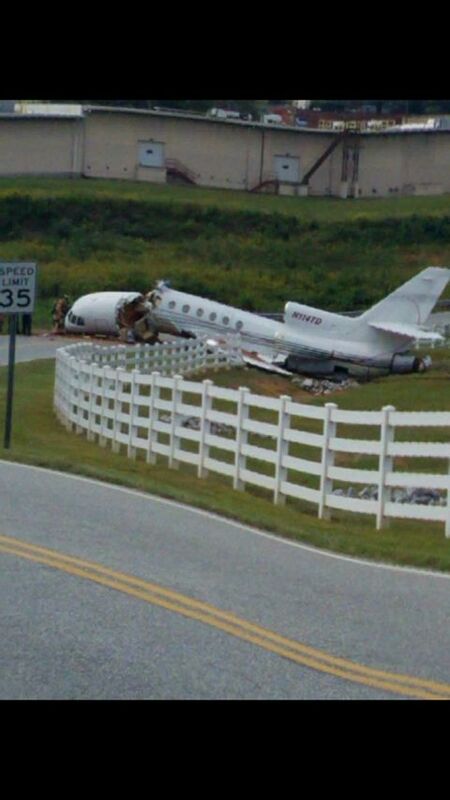 I rem er seeing a series of photos years ago ... A plane sitting in a field with little serious damage ... Certainly to fly again and it did ... The pilot was uninjured except for the small hole in his head from a knob on the panel ... He would have lived if he had used the shoulder harness. The crew should have had harnesses properly fastened to prevent their heads from impacting the instrument panel. The forces experienced by the occupants would have definitely caused injuries, but this just didn't LOOK fatal. The pilot's ages may have been a factor in their demise. When you're 66 years old, you're definitely out of warranty. Fine waste of a nice airplane! Can't wait to read the witness statement from the pilot that had refused the plane/trip due to the anti-skid inop. Too often money obstructs clear thinking. blindsided by this news and terrible loss. Is it possible he was unaware of Fox’s lack of credentials? Is it possible he was unaware of his own lack of credentials? Or are you saying he thought Fox was PIC?